WHAT CAN APPLICATION OF LASER THERAPY DO FOR ANIMALS? 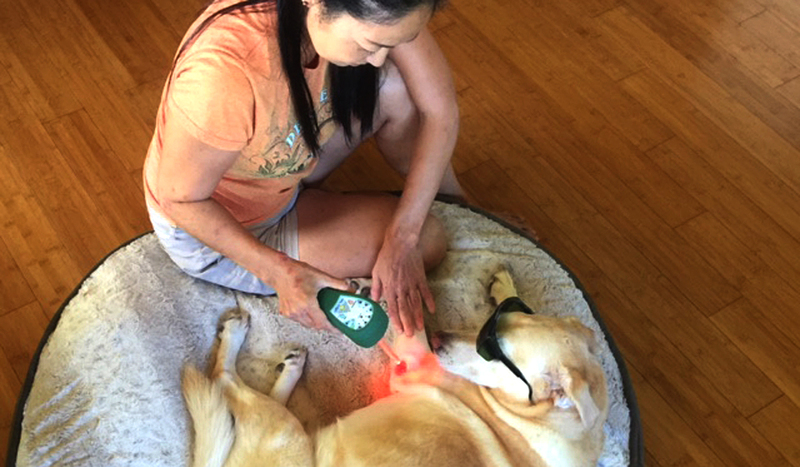 Laser therapy is a non-surgical, non-invasive, and painless therapy that uses modulated infrared to stimulate the animal’s body's cells in injured areas to promote healing. Laser is particularly helpful for arthritis, degenerative joint disease, fractures, joint problems, and many soft tissue injuries. Laser therapy can be a beneficial addition to your pet's over all pain management and rehabilitation program. Treatment that stimulates the animal’s body to heal from within with non-thermal photons of light that are administered to the body and absorbed by the injured cells. As the laser therapy is administered, your pet will relax and enjoy the almost immediate relief of pain. Pain relief is felt in just a few minutes of therapy. Your pet also will be comfortable, and any anxiety experienced will dissipate which can improve the quality of life for your best friend! *The number of treatments depends upon the severity of the condition and it is acute or chronic. Chronic pain due to arthritis would be weekly to monthly depending on amount of pain. LAP is the application of therapeutic laser to Acupoint (TUBO) on the body, ear, or hand. It is a simple, effective, non -invasive approach that has been shown to be a dependable pain management tool. - Only takes 15 seconds per point. Some pets cannot stay still long enough for acupuncture or acupressure treatment. Heat therapy intended to stimulate circulation through application over acupressure point for a smooth flow of Blood and Qi. Also reduces any pain. It is one of the oldest and most effective forms of oriental therapy. Japanese moxa is part of the chrysanthemum family. Also, common use Loquat Leaves is anti-inflammatory, and has a relaxing, very calming smell. The combination of moxa and massage therapy is a powerful benefit to your pets’ aches & any pain issue. Helps senior dogs & cats feel very cozy and enhance the digest system. We want to ensure you can out of town or traveling without worrying about your belove. Pet sitting for senior pups(over 10 years old ), 20% discount from the above price! What does the pet sitter do? Hiro Kawachi is the insured and certified professional pet sitter, a proud member of "Pet Sitters Associates".